The Rifter is a vehicle to numerous Palladium role-playing worlds. It is a tool for Game Masters and players alike. A place to showcase new talent and exchange ideas for the entire palladium Megaverse. Every issue, unique and informative. 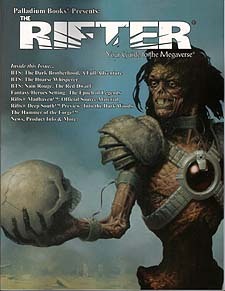 * Rifts: Official Madhaven source material. * Rifts: Story introducing Rifts Deep South, an upcoming sourcebook. * Beyond the Supernatural: The Dark Brotherhood. * Beyond the Supernatural: The Hoarse Whisperer. An insidious monster to haunt your nights. * Beyond the Supernatural: Nain Roughe (aka the Red Dwarf), a bizarre, evil imp and harbinger of disaster. * Heroes Unlimited/Palladium Fantasy: The Epoch of Legends. * 96 pages of fun and spookiness.